Trust and accountability are foremost in the minds of the public when it comes to projects funded with an ITO (“initial token offering”). For any party to collect payment first and deliver the goods later, it is imperative to reduce the risk of non-delivery as far as possible. The Blocknet has the following accountability measures in place. See Multisig Escrow of Funds for more info. The Blocknet's development is open source and therefore its degree of activity and the security of its code are open to review at any point. This allows investors and supporters to rest assured that the project is active and well-executed. The Blocknet's Github repo is here. Before the Blocknet Foundation is formed, representatives from participating coins’ teams will serve as points of contact for the public, and will guide the formation of the foundation. The Blocknet Foundation’s board will be formed before the end of the ITO period. This is of course necessary before funds can be transferred from exchanges, since a multisig address must be created using the addresses of every Board Member. Updates on the Foundation and its rules will be posted to wiki.blocknet.co. In addition, the Blocknet’s development timeline will be converted into a budgetary plan so that the spending of funds is known in advance, can be discussed publicly, and so that consensus can be reached that funds are spent appropriately. The Blocknet Foundation will be registered as a legal entity in due course. This will bring it further accountability, and will ensure that the public have all the traditional legal and civil protections afforded them by society. Furthermore, in order for participating coins to offer certain services (particularly those involving B2B contracts and/or money transmitter services), it is necessary for them to register as legal entities too. 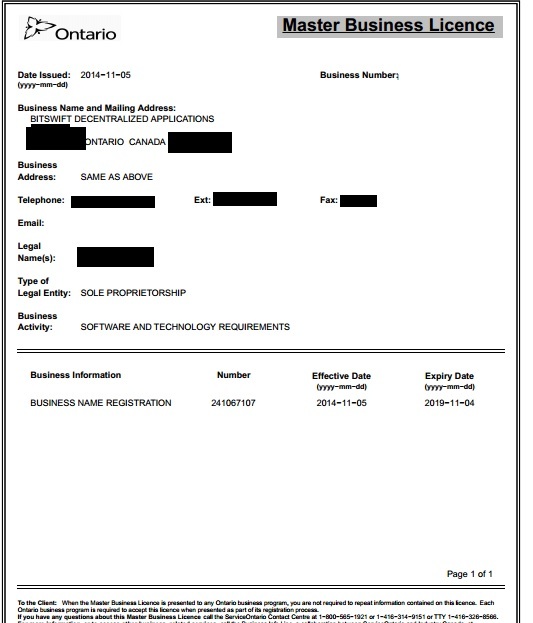 BitSwift is the first to do so, having registered a software development company in Canada. Its Canadian Provincial Business License can be found here (business number to be issued when the registration is approved). This will be the first document uploaded to SwiftExist (a data ownership, timestamping, and document integrity service) once the service launches. Using SwiftExist as a productivity tool remunerates BitSwift nodes by destroying tiny amounts of currency, decreasing the money supply and thus increasing the value of each coin. XC Inc will be formed early next year in order for XCurrency’s plethora of node-based services to be served to traditional businesses. CoinsSource has completed a proof-of-developer review for Dan Metcalf, the visionary behind the Blocknet and the architect of the XBridge protocol. CoinsSource gave the Blocknet five out of seven stars, the remaining two being awarded following a successful completion of its ITO period, and once BLOCK has spent 30 days on an exchange. This page was last modified on 10 November 2014, at 18:08.